My mother was a dance instructor, so I began dance classes at the ripe age of 36 months and never stopped. Although I’m aware that life without dance is possible, I never really understood the point. Dance is my oxygen. However, I understand that not everyone shares my passion. There are a lot of programs out there, so why dance? 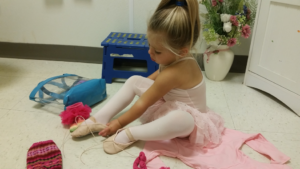 Here are a few of the reasons, my husband and I chose to have all of our children take dance at some point in their lives, whether they chose to pursue it or not. Dance is fun! There is a freedom that comes with music and movement that cannot be found anywhere else. Dance is challenging! – Dancers have to be quick thinkers, embrace change, take constructive criticism, embrace a willingness to work hard; and they learn it takes years and years of practice to great something beautiful and awe-inspiring but they can do it! Dance is respectful!– Dancers learn respect for their bodies, for themselves, for their teachers, for their teammates and for the art-form. Dance is a graceful communicator!– The performing arts teaches dancers to communicate in front of large audiences without words. In a world that makes critical decisions based on body language and confidence, dance prepares students to communicate on every level. Dance provides impossible goals! – Although it sounds simplistic, 30 years of teaching has taught me that a lot of drug use, vandalism, trouble-making and inappropriate social media communication occurs because students just get bored. Dance provides concrete near-impossible goals – winning regional and national competitions, auditioning and receiving scholarships, auditioning for America’s Got Talent, auditioning for the JabberWockeez, pursuing dance and other degrees, and teaching and mentoring with the next generation of students. We teach our students how to achieve these “impossible goals” every year! Dance is disappointing! – Dance, like life, is filled with disappointment. Students literally stare at their reflection for hours trying to perfect a move, put themselves out there through the audition process, and they learn how to deal with disappointment when they don’t get what they had hoped for, yet still had to work hard to achieve what they receive. Dance is Creative! – Dance is a creation using music and the human body – it is visceral, exciting, immediate! It develops individual creativity, which involves reasoning, problem solving, and the ability to come at a problem differently than others. Artist have the confidence and the creativity to approach challenges and to put seemingly unrelated things together in unique ways. Dance is a partnership! – Our dancers learn to function as part of a group, in their dance classes, and later in their dance companies. They learn how to be dependable and how to depend on others. How to lead, create and follow. Dance is engaging – There is no way to sit in the back and look like you are engaged in a dance class. You are either moving or you are not. ← New Roads. New Possibilities.